The little light tube fog light things are missing from my car. It looks like Ford describes them as parking lights if I'm looking at them correctly. Are these the correct part numbers? For a 2010, I'm not sure. 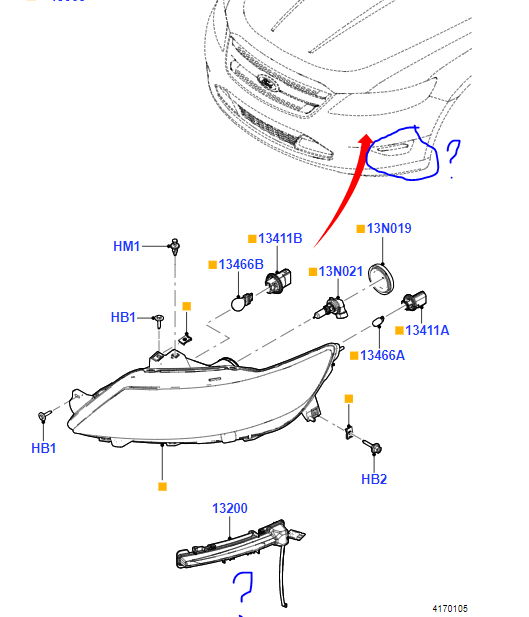 Pop over to fordparts.com, enter your VIN, then locate the part. I looked there and the illustration isn't super clear. I marked the part and area in question in the picture. I believe you are correct. A is one side, B is the other. However, don't take my word for it. Select a dealer in fordparts.com (go incognito, so you can easily change dealers) and see what the pricing is. Bounce between a few in your area and you might find one with a really good deal. Then call them to verify the part number.